If you’re a regular reader of this blog, you know I love to stay at luxury hotels for free. Well, when I was planning our recent Disney trip, I realized that there’s no “free” when it comes to staying on Disney property. But there are lots of ways to stack various discounts. 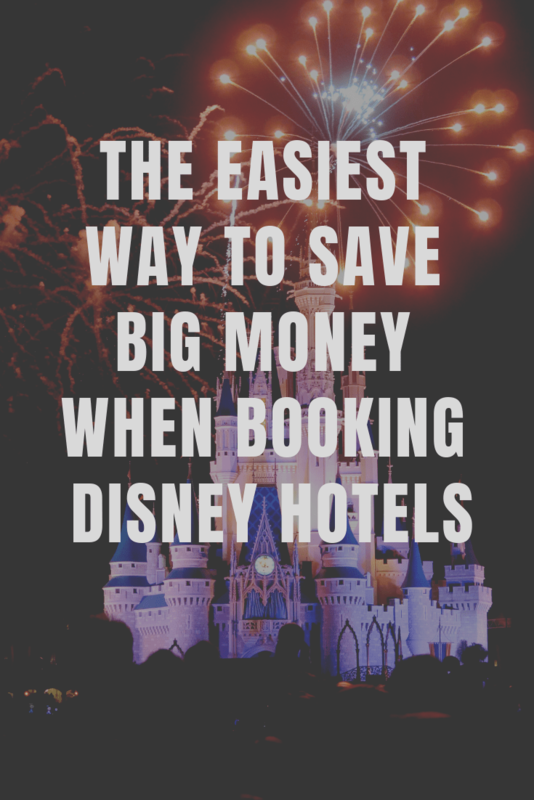 This is just one of many ways to save money on Disney hotels, and I include links to other methods at the bottom of this post! Signing up for loyalty programs. If you’re familiar with all three of those concepts, skip down to the section entitled “Getting discounts on Disney hotels.” However, if you need a primer on cash back portals and buying discounted gift cards, i’ve included a summary below. I love shopping portals. Also called cash back portals, these are an easy way to get additional savings on things you were going to buy anyway. Some popular cash back portals include Ebates, Mr. Rebates, and TopCashback. There is literally nothing I buy online without first checking if the store offers a cash back rebate. I usually check cashbackmonitor.com and enter in the name of the store that I’m about to order at online. Then, I figure out which one has the highest cash back rate. Let’s say, in this circumstance, it’s Mr. Rebates. Then, from CashBackMonitor, I go to MrRebates.com. On MrRebates, I enter in the name of the store where I’m shopping, and then follow the link to the store from there. That’s it. Voila. I’ve made $34 in cash back in the last three months from Mr. Rebates alone just from regular purchases I was going to make anyway. There’s literally no added cost to you for the transaction. There are no catches, fees, or gotchas. Don’t believe me on my little known blog? Check out some of the well respected personal finance reviewers and their take on sites like Ebates, including at NerdWallet or The Penny Hoarder. Okay, so now that you’ve had a little intro to cash back portals, you’re set for the rest of the tutorial. But first, go ahead over to Mr. Rebates and Ebates to sign up for accounts, and we’re ready to proceed! Have you ever gotten a gift card that you didn’t want? Of course, we all have. And, when people don’t want those gift cards, they can opt for selling their card at a discount to a gift card reseller. There are TONS of these sites around these days, and I have used them to buy lots of gift cards (although never to sell gift cards). It’s always been a positive experience! For example, I purchased several hundred dollars worth of Home Depot gift cards from Raise.com a few years ago to help save money on a home improvement project. So, part of our method for saving money on Disney hotels will also involve buying discounted gift cards for hotels.com on Raise . (You can use other gift card resellers too, like GiftCardMall or Cardpool or Giftcards.com, but those resellers don’t have as great of cash back portal options). Okay, here’s the real meat of the tutorial. Like I mentioned earlier, there are a million ways (okay, maybe dozens) to get discounts on hotels on Disney property. This is just one of many, and it’s the one I used to book the Port Orleans Riverside at Walt Disney World. 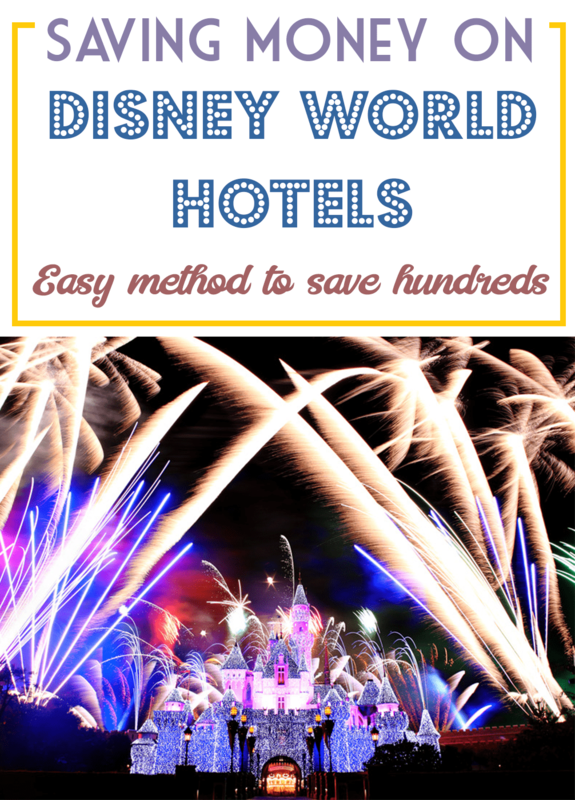 Once you’ve figured out what Disney hotel you would like to stay at, follow this process for maximizing your savings when booking the hotel. Step 1: Go to Mr. Rebates and search for Raise.com. (At the time of writing, Mr. Rebates has a better cash back rate (3%) than Ebates (1%), but always double check first to make sure that’s still the case. Cash back redemption rates can change frequently! 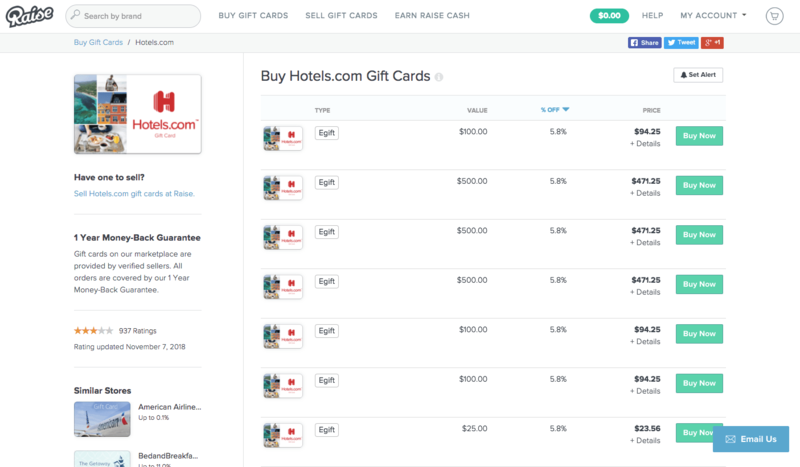 Step 2: Buy discounted gift cards for hotels.com from Raise.com after clicking on the link from Mr. Rebates (or Ebates if they have the better deal). As of this time of writing, hotels.com gift cards are selling for 5.8% off their face value, which is already a great savings for your Disney hotel. Buy as many gift cards as you’ll need to cover your Disney hotel expenses. Step 3: Now, wait until the gift card reseller delivers your discounted gift cards. In my experience, this can take up to several hours, even for electronic delivery of the gift cards. Step 5: Follow the link at Mr. Rebates or Ebates to hotels.com. Enter in the dates of your stay at hotels.com, and book your desired Disney hotel just like you would on any other travel booking site. Step 6: Instead of entering your credit card as your payment for your booking, enter in the gift card redemption codes as your payment. (Of course, depending on how many gift cards you purchased, there might still be a balance you have to pay with your credit card). Can you see now how all these discounts are adding up? Let’s just say, in this example, that you’re spending one night at a Disney hotel and it’ll cost your $300. Let’s see how following my technique can save you some big bucks. There you are, you’ve now saved about 41 bucks on your $300 hotel room. Not too shabby for something that hard to get a discount for! And all for about a total of 5 minutes worth of work. Make sure you sign up for the hotels.com loyalty program. For every ten nights you book using hotels.com, you get one night free! During our last Disney stay, we stayed five nights. BUT, I booked the hotel rooms for both me and Ken, as well as the room for my Sister-in-Law and her family. So, that was ten nights right there! I was able to use the free night when booking a future hotel. So that adds to your overall discount even more! But Shouldn’t I Book Directly Through Disney? Nope, totally unnecessary. One of my favorite bloggers on Disney Discounts, The Deal Mommy, lays out excellent reasons for why to book through a 3rd party site instead of directly through Disney. (Note that this is not the case for other hotels chains or when booking airfare. I hardly ever recommend booking through third party sites for anything other than Disney unless there’s some sort of huge discount being offered). 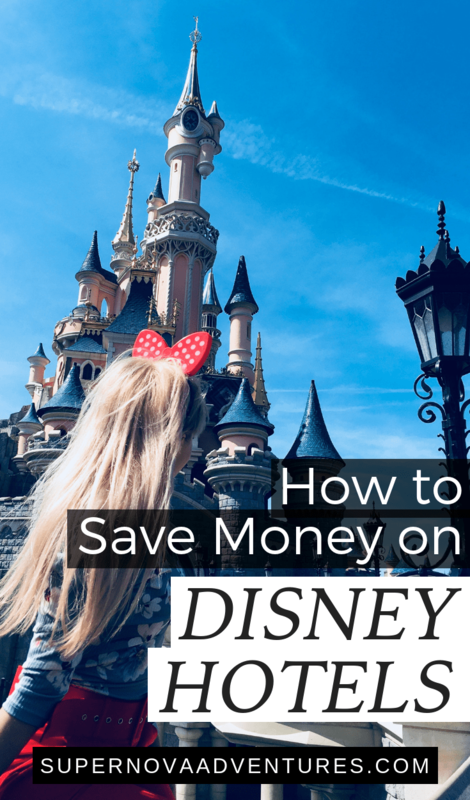 She also has other great Disney savings hacks too, like this one! Looking for ways to save on other Disney expenses, like your park tickets? Be sure to check out all the booking options and discounts at Undercovertourist.com, like Saving $53 on a Disney World 4-Day Park Hopper, or all sorts of other discounts on Disney tickets that you can think of! What are your hacks for getting Disney hotel discounts?